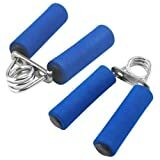 This 2 pack of TRIXES hand grippers are ideal for building you muscles around the hand and wrist area. Foam padded handles means this item can be used without stress over and over again. Whether you are strengthening your muscles or strengthening a wounded hand this is the perfect piece of equipment for you. Great for strengthening your grip and toning your forearms.